Cataract surgery is a procedure used to treat cataracts, where changes in the lens of the eye cause cloudy, blurry, or misty vision. It’s the most common operation performed in the UK, with more than 300,000 procedures carried out each year. 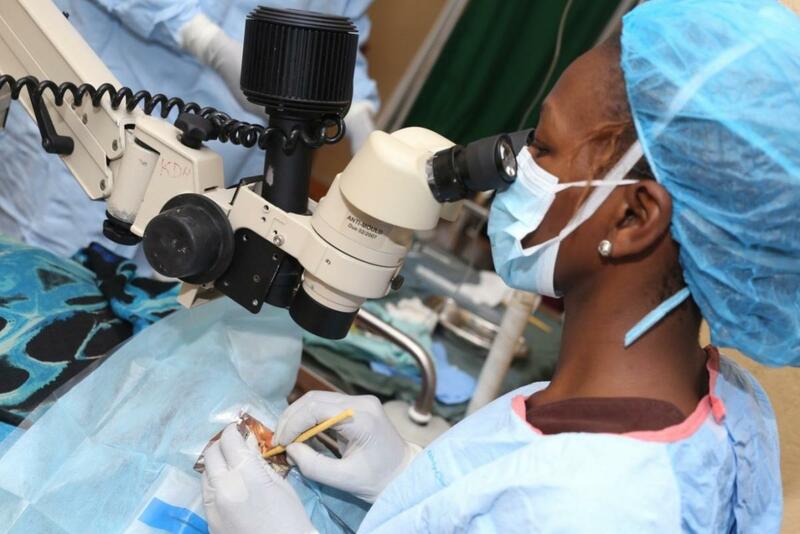 In Kenya Kikuyu hospital eye unit conducts between 70-80,000 patients a year in 1998 Kikuyu performed 53%, Lions 9% and Nakuru 4% of all the 9495 cataract operations reported in the 1998 annual report of the Kenya Ophthalmic Programme. When light enters your eye, it passes through the transparent layer of tissue at the front of the eye (the cornea) and the lens, which focuses it on the light-sensitive layer of cells at the back of your eye (the retina). Cataracts sometimes start to develop in a person’s lens as they get older (age-related cataracts), stopping some of the light reaching the retina. This can affect your vision, making it become increasingly cloudy, blurry, or misty. Although cataracts are often associated with age, in rare cases babies are born with cataracts or young children can develop them (childhood cataracts). This topic focuses on surgery for adults with cataracts. Slight cloudiness of the lens is a normal part of ageing. Significant cloudiness, or cataracts, usually get slowly worse over time. Surgery to remove them is the only way to restore vision. However, surgery isn’t necessary if your vision isn’t significantly affected and you don’t have difficulties carrying out everyday tasks. Cataract surgery is available on the NHS if you’re having difficulty with activities such as reading, driving, or looking after someone in your care. Cataract surgery is a relatively straightforward procedure that usually takes 30 to 45 minutes. It’s often carried out as day surgery under local anaesthetic, which means you’ll be awake during the procedure and can go home on the same day. During the operation, the surgeon will make a tiny cut (incision) in your eye so they can remove the affected lens. After it’s been removed, a small plastic lens called an intraocular implant or intraocular lens will be inserted. If you have cataracts in both eyes, you’ll have two separate operations carried out a few weeks apart. This gives the first eye time to heal and time for your vision to return. Read more about how cataract surgery is performed. You’ll normally be able to go home a few hours after having cataract surgery, but you’ll need to arrange for someone to collect you and take you home. Take it easy for the first two or three days after the operation and make sure you use any eye drops you’re given while in hospital. You can continue doing most of your normal activities after cataract surgery, although you’ll need to avoid touching your eye or getting anything in it, such as soap and water, for a few weeks. Most people’s sight will improve soon after having cataract surgery, although your vision may be blurred for a few days. Most people need to wear glasses for near or distance vision – or both – after cataract surgery. This is because artificial lens implants can’t focus on a range of different distances. The surgeon will normally aim for more focused distance vision, with dependence on reading glasses for close up work, although this depends on the strength of your glasses and individual circumstances. With glasses, most people have a good enough level of vision to be able to drive and carry out everyday activities without any problems. Your vision may not be restored to normal if you also have another eye condition or in the rare event of a serious complication. The risk of serious complications developing as a result of cataract surgery is small. The most common complication is a condition called posterior capsule opacification (PCO), which can cause your vision to become cloudy again. In PCO, a skin or membrane grows over the back of the lens implant months or years later. If necessary, PCO can be treated with a simple laser eye surgery procedure to cut away the membrane. Most complications that can potentially develop after cataract surgery can be treated with medication or further surgery, and don’t usually have a long-term impact on your vision. However, there’s a very small risk – around 1 in 1,000 – of permanent sight loss in the treated eye as a direct result of the operation. Latest News in Opthalmology | Department of Ophthalmology University of NairobiDr. Lily Nyamai performs cataract surgery on a patient. The risk of serious complications developing as a result of cataract surgery is very low. Most common complications are treatable and don’t have a long-term impact on your vision. The risk of complications is higher in people with other eye conditions, such as uveitis, severe short-sightedness (high myopia) or diabetic retinopathy. The risk of complications is also higher if you can’t lie flat easily, have problems breathing, or are taking tablets for prostate problems. Ask your eye surgeon (ophthalmologist) to explain the possible risks before the operation. The main problem that can occur after cataract surgery is a condition called posterior capsule opacification (PCO). This is where part of the lens capsule – the “pocket” the lens sits inside – thickens, which can cause cloudy vision. This isn’t the cataract returning, but a skin or membrane growing over the back of the artificial lens. Less than 10% of people who have cataract surgery will eventually develop PCO, usually within two years. If you develop PCO and your vision is affected, you may need laser eye surgery to correct it. During this procedure, the cloudy part of the lens capsule will be removed, leaving enough of the capsule to hold the artificial lens in place. Laser eye surgery for PCO is a short and relatively simple procedure that usually takes about 15 minutes. Your vision should either be improved immediately or within a few days and, as no surgical incisions or stitches are necessary, you should be able to return to your normal activities straight away. Other complications of cataract surgery are much less common, but can include those listed below. You should seek immediate medical advice if you experience any loss of vision or increasing pain or redness after cataract surgery. It’s usually possible to successfully treat complications that arise from cataract surgery with medication or further surgery. Rarely, your vision may be worse than it was before surgery. There’s also a very small risk – around 1 in 1,000 – of permanent damage to your eye, causing a loss of sight. However, the majority of people have a good result from surgery and are happy with the improvement in their vision.